Actually every time I see Vader now I think of Anakin. And bad guy or not,he was one hell of a warrior! The Vader of RO is the Vader we all wanted to see....the dark menacing figure that the rebels (and even imperials) were terrified of....I'm glad they had lightsaber scene in RO.....hopefully some novel or comic will tell us more about the sith cave on Mustafar. It's funny but I don't want Kylo to be like that. Before the thing becomes legal, LEGO will do! I finally went to see Rogue One a few nights ago. I really liked it and thought it was well done. I enjoyed all the new characters and the Vader stuff at the end. I definitely was happy to see that Lucas film is taking their stories away from the black and white into the grey moral realm. It made the story much more interesting to me. Another thing that I liked was that they seem to be moving away from anyone with the force can only be a jedi. They are diversifying the force users such as Churrit's character (not sure if I spelled his name right) who seems to be force sensitive but more like a priest instead of a warrior. Though he is, he def. uses the force to battle but not with a light saber. My opinion about whether or not Rogue on was better than TFA. Personally I liked them both. Did Rogue One take more chances than TFA. Yes, but I feel JJ and company had to do what they did to bring back to life the sequel trilogy. I have always felt that TFA was written with all the call backs and nostalgia of the old trilogy to hook the audience and then introduce the new characters. They also subtly, if you watch closely, hint at the direction that Lucas film is taking the new cannon in Star Wars: more grey and complicated/conflicted heroes. They didn't take huge chances for TFA but after seeing Rogue One and the response from the audiences I have big hopes for the next two trilogy movies. I believe they will take those chances with the new movies. I can see Kylo being a lot like Cassian, if he becomes 'redeemed.' Rey like Jyn...not super good or bad. Just a couple of my thoughts. Yes, I did like the vader scenes. I thought they did Vader well in this movie. Cassian and Jyn are the blueprints for what Rey and Kylo will become. I'd love it if they could somehow refer to the Rogue One team in VIII and IX. However, I do wonder whether the KOR are some sort of reanimated group of baddies from the time of the Empire.....maybe inquisitors or dark jedi? Ibelieve there's a fanfiction out there based on that; I have to admit I'd love that. I really do think that's his castle behind the KOR in that scene and i think it's mustafar and I think it's the past. If you look closely, it seems like you can't actually see the top of that structure in tfa? Which planet was similar to the name obi wan in rougue one? Was it the rainy one? I'm very interested in the sith cave....we have an ancient sith shrine on Coruscant under the jedi temple (Coruscant was one of the places thought to be the location of the first jedi temple according to the Galactic Atlas, I think)....then we have the cave of darkness on Dagobah (again a force strong planet).....since Jakku has a pilgri,s road and all sorts of weird anchorites, I wonder if Jakku also has an underground sith cave or shrine which Palpatine was after..... Jakku sounds a lot like Jedha...maybe it has a similar spiritual history. 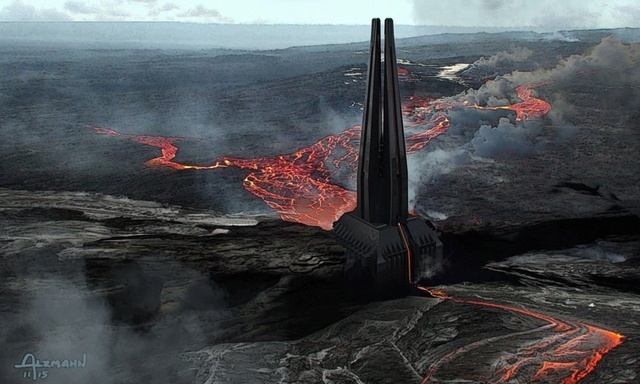 Another curious thing- if Vader's castle is like a tuning fork and the opposite of the temple of the Whills, the bifurcation of the towers could represent a crack in the case of Vader's castle, in contrast to the single triangle on Jedha....it reminds me of how the dark side imposes its will on the force in contrast to the light side which follows the will of the force. We saw Rogue One again tonight. I was worried that seeing CGI Carrie at the end would choke me up, but that shot comes immediately after the adrenaline rush of the Vader-in-the-hall scene, so I was okay. I did tear up a lot worse at the Jyn-and-Cassian on the beach shot this time around. And that scene in the elevator lasted a lot longer than I recalled the first time around. It's pretty much an unmistakable "just kiss already!" moment, or at least, I felt that way on second viewing. I think one of the planets was called Wobani; might have been the site of the labor camp but I'm not sure. I believe the rainy one was Eadu, where they found Galen Erso and the weapons research station. I was joking with my husband about the elevator scene between Jyn and Cassian....we are going to die in a few minutes can we make out? If we get a scene like this in eight between Rey and kylo I will be happy. Well, if they could do so much with so little in Rogue One, they could do the same in Ep VIII! You are correct. Wobani was the name of the prison labor camp planet. Eadu was where Galen Erso was located. There WERE a lot of planets. It seems like they could have combined a few settings without losing anything. For example, did the prison camp need to be on a separate planet from some of the other Imperial occupied planets? And the trading post where Cassian wound up killing the informant, did that really need to be a new/separate setting? I kind of wonder if some of these were being introduced to canon because they'll show up in other things down the line. For some reason I liked there being all those planets, and being told the names. The frenetic hopping from place to place contributed to the feeling I got of the chaos from a galaxy at war. More than any other Star Wars film, more than ANH or ESB or AOTC, I felt I was in a galaxy at war. @MyOnlyHope and I FINALLY saw Rogue One today. It was great, pretty much exactly what I was expecting! Saddest moment for me was K2SO's death (I knew I was going to have a soft spot for him before I even saw the movie because he had such sweet eyes in the promos). He was so cute too, ugh. I'm glad all the rumours that the ending was changed turned out to be entirely false. The film really had to have that kind of ending IMO, it was really impactful. I really loved seeing the old temples and learning that the Death Star's weapon was made out of refined kyber crystals. Also, I'm not sure I agree with some statements I've seen elsewhere in reviews and such that there was no romance in this film. There was definitely something between Jyn and Cassien, but it was subtle. You get the sense that it would have gone somewhere had the story not ended when and how it did. Just goes to show you don't need anything overt or forced.